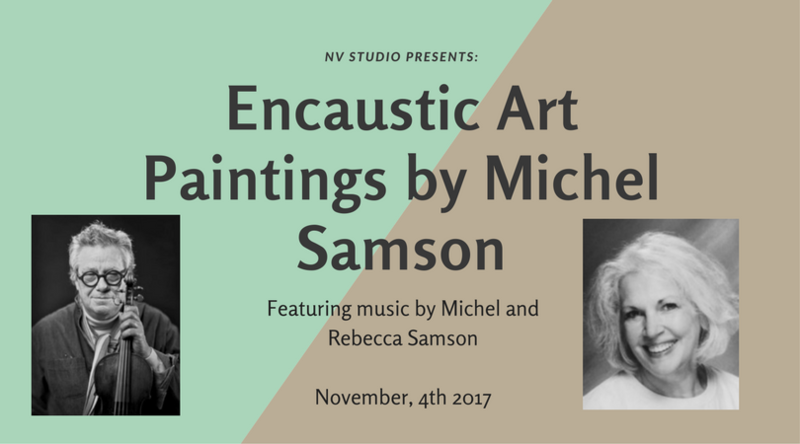 Sioux Falls, SD (October 30, 2017) The fall season begins at NV Studio, located at 106 W. 11th Street, with an exhibition of 10 recent encaustic paintings by renowned painter-musician Michel Samson. Samson, a native of Holland, comes from a family of artist in the culturally rich environment of the Netherlands. Samson began drawing and painting as a young child to early success, as he was often recognized for artwork in competitions. His paintings have been featured in a solo exhibition at the Fort Wayne Art Museum as well as various galleries in The Hague and Amsterdam. The exhibition opens with an artist’s reception on Saturday, November 4 at 5 pm. The exhibition will continue for two weeks and will be open during regular studio hours. Prior to the opening, at 4:30 pm individuals are invited to attend a brief Baroque piano and violin concert performed by Samson and his wife, Rebecca. The concert will be held next door to NV Studio at the Sioux Falls Design Center. The word, “encaustic,” owes its origins to Ancient Greece. It translates to, “to heat,” and as such, the application of heat is the basis for encaustic painting. This ancient medium was used in Pompeii and Ancient Egypt during the first century AD. This process, now uncommon, uses molten beeswax combined with dry pigments and natural resin. “Here at NV Studio I am delighted to host Samson’s exhibition. His encaustic technique creates subtle surfaces that are luminous with a sculptural element,” shared Julia Collins, owner of NV Studio. “This genre is truly unique, and I am excited for people in the Sioux Empire to visit NV Studio and experience Samson’s creative works,” continued Collins. NV Studio is the unique combination of an art studio and a single styling chair hair salon. This petite space in the Boyce Greenly building downtown is filled with original art that promotes a distinctive, sophisticated atmosphere. The artwork creates a soothing, healing visual experience, and all products used and sold at NV Studio are safe, clean, and effective at fostering natural health. A passion for art is essential to NV Studio’s mission. Exhibiting various artistic mediums celebrates each artist’s talent and the authentic way they pour their souls into their work. One simply needs to enter the studio to connect with this passion. For more information visit www.nvstudiosalon.com. Michel Samson, a native of Holland, comes from a family of artists who worked in various visual arts in the culturally rich environment of The Netherlands. He began drawing and painting as a very young child, often winning prizes and other recognitions for his artwork. His paintings have been featured in a solo show in the Fort Wayne Art Museum and various galleries in The Hague and Amsterdam. In addition to traditional Western paintings and drawings, Michel has produced etchings and prints as well as Japanese-Chinese works on paper. He has studied Chinese calligraphy and Japanese Sumi-e, teaching workshops and holding lecture demonstrations on ink and paper techniques. Michel has a large collection of Japanese woodblock prints and scrolls. As a violinist, Michel is an active researcher of early Baroque music and released a recording of Italian works for violin and claviorganum with his wife, Rebecca, last year. He started violin lessons at the age of five. In 1963, he was awarded a Dutch Government Scholarship to continue his violin studies in Rome with Alberto Lysy. Because of Mr. Samson’s keen interest in violins, while living in Italy he had the chance to meet and learn from legendary Mid-20th Century makers such as Giuseppe Lucci in Rome and Ansaldo Poggi in Bologna. In 1965 Michel Samson was again awarded a Dutch Government Scholarship to further pursue his violin studies in New York where he was mentored in the area of violin expertise by such giants as Fernando Sacconi and Dario D’Atilli. Based on his reputation as an astute expert in string instruments and their bows, in 1997 the Chicago firm of Bein and Fushi (https://beinfushi.com/notable-sales/) asked Michel Samson to be their European Representative as well as their representative for the American West Coast. In that capacity, Mr. Samson was responsible for acquiring and placing some of the most coveted examples of Italian violin making. In his role as advisor to orchestras such as The Royal Concertgebouw of Amsterdam, The Bayerische Rundfunk, the Residentsie Orchestra in The Hague, etc., and important private collectors, Mr. Samson established excellent working relationships with some of the most distinguished experts in the field during his tenure at the firm. Since his retirement as an active violin dealer in 2005, Mr. Samson has been in demand as a consultant for prospective buyers and sellers based on his vast experience in the identification and appraisal of the most important string instruments and their bows. He is considered by his colleagues to be the foremost expert in the violin business worldwide.